Get up 30 minutes early to workout. Ask your partner/spouse to make breakfast in the morning while you fit in a workout before work. If you go out for lunch with coworkers every day, reduce it to 3x a week and spend 2 days going for long walks during lunch. Instead of having friends over for beer and board games, organize a touch football or friendly soccer game. Jump rope with your kids. 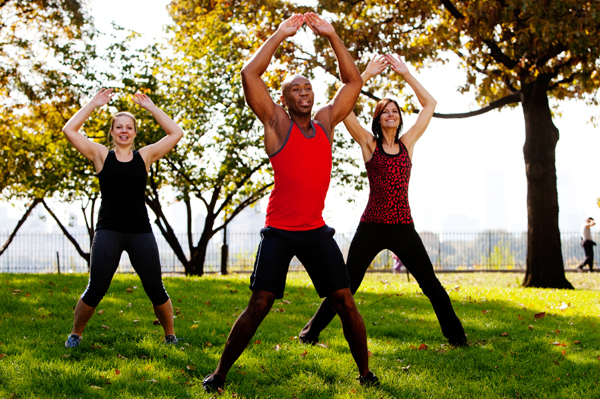 Take your kids to the park and while they play, do squats, lunges and jumping jacks. If your kids are in swim lessons, spend those 30 minutes swimming laps in the lane next to them. Look at your TV watching habits. Is there one show you can eliminate to fit in some fitness? Watch TV and workout at the same time. Get a bike trainer for your living room. Swap babysitting with another mom so you can go to the gym a few times a week. Take the stairs instead of the elevator everywhere you go. Do squats while you’re on the phone. Even at work! Bike to work. Saves time by combining commutes AND fitness! Have a set of free weights in your cubicle and do exercises during your break times. That adds up to 30 minutes a day! Play tag with your kids and run around like a kid! Do your school readings while on the elliptical or bike trainer! While your kids are at soccer or football practice, walk the track with another mom/dad. While your kids are at sports practice, run the stadium stairs. Start a “Biggest Loser” contest with coworkers to stay motivated. Go for hikes on the weekends with the family. Quality time + fitness = smart! Keep your gym bag in the car and go straight to the gym after work. Avoid stopping at home. Join a running group near work. Wake up 15 minutes early to jog with your dog before work. Speed walk to the store when you just need to pick up a few things. Start your morning with push-ups and sit-ups. Instead of meeting friends for happy hour, meet them for power walks in a park. Change your workouts with the seasons–in summertime, bike. In winter, snowshoe. In spring, train for a 5k. In Fall, go for a hike to see the fall colors. Go dancing on Friday night. QUESTION: How do you fit in fitness when you don’t have time? It may seem silly, but there are two things you can do to workout ANYWHERE and ANYTIME. Working out doesn’t have to be complicated, a gym membership isn’t necessarily needed, and you don’t have to drive somewhere to get fit. Sometimes all you need is to return to the basics. These two activities are perfect for people that want to work out at home, or if they are on the road traveling and don’t have access to a gym. When I workout at home my typical workout includes the bike trainer + a circuit of jumping jacks, jump rope and weight lifting. In fact, in a few weeks I’m going to start doing the home workout again to avoid the overcrowding at the gym. *Add 10-20 jumping jacks after before every pushup set and get some cardio benefit out of it. You can do the jumping jacks in your normal workout, or do it during commercials when you’re watching TV. If you can only do a few at a time, switch off from jumping jacks to ab work on the floor or do some squats, then back to jumping jacks. Really, it’s all about staying in your target heart rate zone and burning those calories! If you’re a crossfit junkie, they often incorporate the jump rope and jumping jacks into the routines. Lots of people are doing ’em! The jump rope is the same concept as jumping jacks. It elevates the heart rate, burns calories and trust me, by the time you’re done with a set your arms will be aching. The best part about the jump rope: it’s cheap. I bought a jump rope at Ross for about $3. I bet the Dollar Store has them too. Pick one up to have on hand for the next time you work out at home. 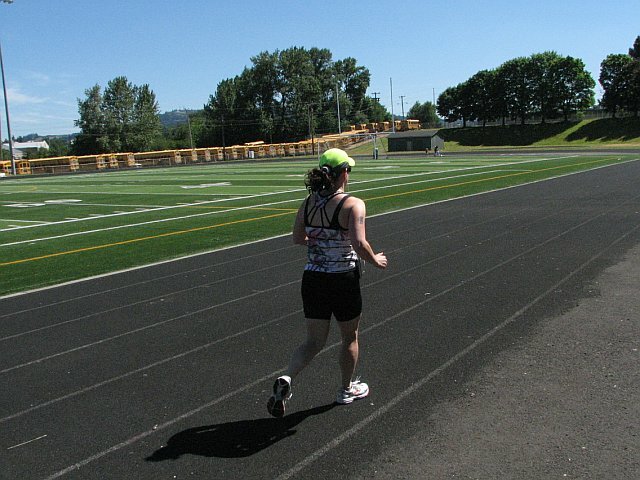 When I was running a lot I sometimes took a break mid-run to do some jumping jacks. It kept my heart rate up but gave me a quick break from the mileage. If nothing else, it was variety. Of course, the jump rope takes a little more coordination than normal, and definitely more than jumping jacks! It can improve coordination, agility and endurance. Here’s another workout suggestion for jumping rope. Next time you’re short on time and don’t think you can make it to the gym, try doing these two things for 20-30 minutes at home and see how you feel! Note: Obviously consult your doctor first. Jumping jacks and jump rope exercises can sometimes aggravate knee issues. QUESTION: Do you utilize these at-home workout routines? Any other suggestions for gym-free workouts?